Offering excitement for all ages, the parade will be held on Tuesday, February 28, starting in front of the Sheraton Hotel at 8 pm. So gather your masks and friends and get ready to catch beads by the handful! 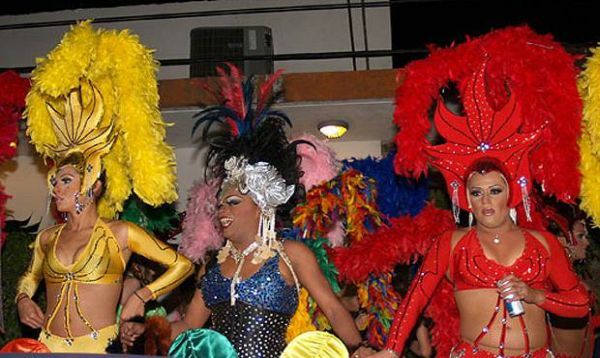 Puerto Vallarta, Jalisco, Mexico - Puerto Vallarta joined in the Mardi Gras Carnaval endeavor a few years ago, with the rallying of the robust gay community. We've enjoyed the past few years, watching the dazzling, stunning displays roll by on Fat Tuesday. Puerto Vallarta has no shortage of beautiful people and they seem to all show up for this amazing celebration. We have never seen so much makeup used in such a short period of time, which also accounts for a lot of that beauty being in the eye of the beholder. This year the fee to join the parade is only $200 pesos, and everyone is invited to participate. So get your ribbons and paints and scanty underwear ready! It's going to be a great party! The festivities of the ninth Carnaval parade in Puerto Vallarta begin officially on Tuesday, February 28th at 8 pm. The starting point will be at the Sheraton in the south end of the hotel zone, and will travel down the Malecón, taking a right on Venustiano Carranza, continuing onto Olas Altas, and end turning up the hill of Rodolfo Gomez. Anywhere along the route is good viewing, but we recommend arriving early to claim your spot. Tens of thousands are predicted to attend. If you plan to participate in this fiesta, there's still time to register at www.carnavalpv.com. But please respect the locals when you put together your costumes; nothing offensive or vulgar. There will be parties galore all over Zona Romantica and many restaurants will have special Mardi Gras specials. Expect exceptional beef and chicken dishes, since the Fat in Tuesday is all about consuming a lot of meat in preparation for the coming forty day fast of Lent. The word carnaval literally translates to do without meat. Special musical presentations are also part of the revelry and don't be surprised if you see a lot of people dancing in the streets; wear comfortable or dancing shoes, depending on your expectations. There will likely be a lot of walking and we recommend to always be prepared for some impromptu salsa. Get ready to catch beads, blow whistles and kisses, and stay out late.